Citation: Say B. 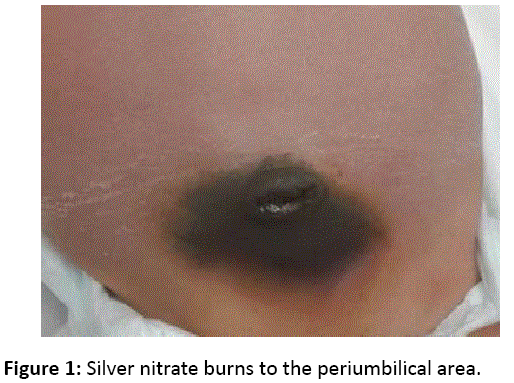 Silver Nitrate Burn after Umbilical Granuloma Treatment: A Case Report. Skin Dis Skin Care. 2017, 2:1. Copyright: © 2017 Say B. This is an open-access article distributed under the terms of the Creative Commons Attribution License, which permits unrestricted use, distribution, and reproduction in any medium, provided the original author and source are credited. The most commonly used treatment of umbilical granuloma is silver nitrate cauterization that comes mounted on a wooden stick applicator in a concentration of 75% [1-3]. Its use can result in burns to peri umbilical skin, so caution should be exercised during application [4-6]. A male patient was born in Turkey at 37 weeks of gestation via lower segment cesarean section delivery with a birth weight of 3300 g and a length of 50 cm. His mother was 29 years old and his father was 32 years old, both were healthy and unrelated. The mother did not use any medications during pregnancy (Figure 1). Figure 1: Silver nitrate burns to the periumbilical area. No prenatal ultrasound scan was performed. There was no family history of ID or congenital anomalies. The mother was allergic to silver. She was referred on the 10th day. On clinical examination, we noted a umbilical granuloma and chemical burns to the peri umbilical area. It was found that he once treated with umbilical granuloma for 75% silver nitrate stick. Treatment was conservative, and the outcome was good in the case (Figure 2). 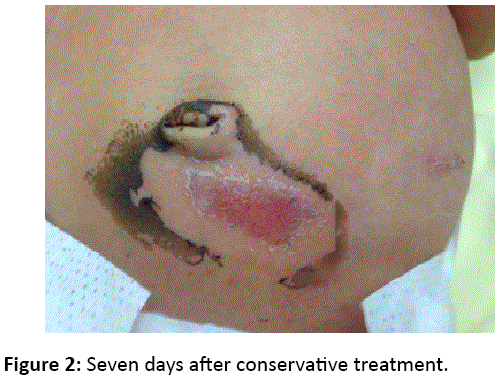 Figure 2: Seven days after conservative treatment. It is a common paediatric problem that needs simple treatment with local cauterization with silver nitrate [7,8]. This chemical acts as an antiseptic, astringent, or caustic agent depending on the concentration. This chemical cauterization has been reported to cause periumbilical Cutaneous burns [9-11]. Careful drying of the umbilical exudate to prevent spillage is essential in preventing staining of the skin or chemical burns [12-14]. There have been case reports documenting burns following silver nitrate application. The literature reveals that silver nitrate has also been implicated as the causative agent in contact dermatitis, although it is generally thought to be a rare occurrence [15-18]. In this case we thought that silver nitrate burn at the peri umbilical area could be related to the mother's silver allergy. Instead of silver nitrate application, it could be a more rational approach to utilize alternative methods for umbilical granuloma treatment of babies of the mothers which are allergic to silver. For umbilical granuloma treatment of babies of the mothers which are allergic to metal it will be a wise move to use a cautious approach while using silver nitrate. Sheth SS (1981) Cryosurgery-a new modality for the management of umbilical granuloma of newborn. ÃÂ°ndian Pediatr 8: 909-912. Wakefield M, Banham D, McCaul K (2004) The Cochrane Library, Issue 3. Chichester: John Wiley & Sons Ltd.
Mshelbwala PM, Sabiu L, Chirdan LB, Ameh EA, Nmadu PT (2006) Persistent umbilical discharge in infants and children. Ann Trop Paediatr 26:133-135. Majjiga VS, Kumaresan P, Glass EJ (2005) Silver nitrateburnsfollowingumbilicalgranulomatreatment. Arch Dis Child 90: 674. Nagar H, Mabjeesh NJ (2000) Decision-making in pediatric varicocele surgery: use of color Doppler ultrasound. PediatrSurgInt 16: 75-76. Chamberlain JM, Gorman RL, Young GM (1992) Silver nitrate burns following treatment for umbilical granuloma. PediatrEmerg Care 8: 29-30. Sankar NS, Donaldson D (1998) Lessons to be learned: a case study approach. Finger discoloration due to silver nitrate exposure: review of uses and toxicity of silver in clinical practice. J R Soc Health 118: 371-374. Nagar H (2001) Umbilical granuloma: a new approach to an old problem. PediatrSurgInt 17: 513. Sheth SS, Malpani A (1990) The management of umbilical granulomas with cryocautery. Am J Dis Child 144:146-147. Wooltorton E (2003) Noninvasive Treatments for Umbilical Granulomas. Am Fam Physician 15: 698-700. Behrman (2000) Nelson Pediatrics, Saunders, p: 528. Lotan G, Klin B, Efrati Y (2002) Double-ligature: a treatment for pedunculated umbilical granulomas in children. Am Fam Physician 65: 2067-2068. North Bristol NHS Trust (2005) Care of the umbilical granuloma. Chow M, Durand B, Feldman M, Mills M (1984) Handbook of Pediatric Primary Care. Delmar Publishers Inc, Albany, NY, USA, pp: 275-276. Betz C, Hunsberger M, Wright S (1994) Family-Centered Nursing Care of Children (2nd edn.). PAWBSaunders Company, Philadelphia, pp: 1458-1459. Graham M, Uphold C (1994) Clinical Guidelines in Child Health. Florida:Barmarrae Books, Gainsville, pp: 423-426. Kesaree N, Babu PS, Banapurthamath CR (1983) Umbilical granuloma. Indian Pediatr 20: 690-692. Daniels J (2001) Is silver nitrate the best agent for management of umbilical granuloma? Arch Dis Child 85: 432.